Today I’m pleased to announce the immediate availability of Banktivity 7! For over the past year and a half we’ve been hard at work on bringing you the best version of Banktivity we’ve ever created. So without further ado, let’s jump in explore what is new in version 7! Apple has set up a pretty predictable launch schedule with its new versions of macOS and iOS. It goes like this: in June at the World Wide Developers Conference Apple gives us a preview of the new features that are coming. Then we have about three months to adopt any of the new features in the operating systems and make sure our apps don’t just break with the new versions. 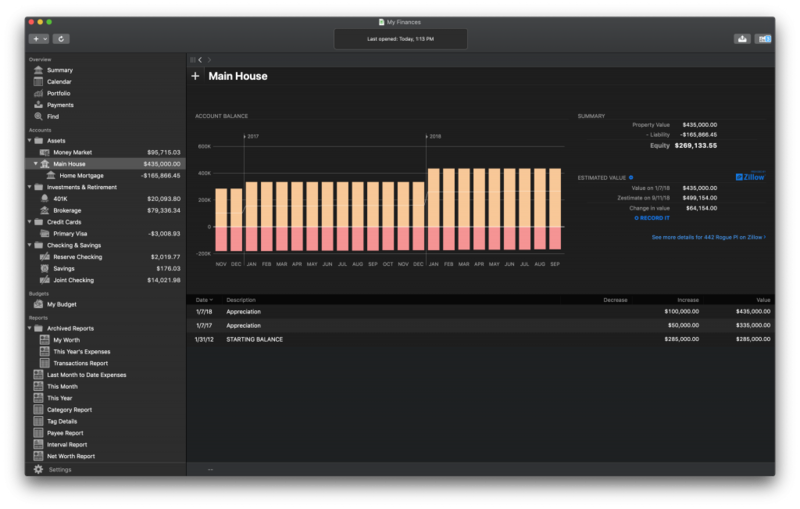 When we saw Dark Mode in Mojave, we knew we wanted to support it. 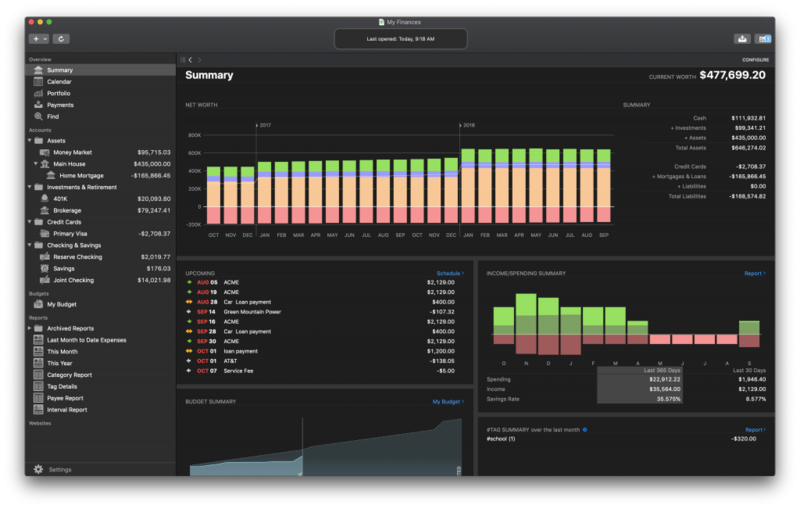 Dark Mode is great for so many different uses on your Mac and for many people here at IGG it has become their preferred work environment. Banktivity credit card register with new and uncleared transactions separated out. 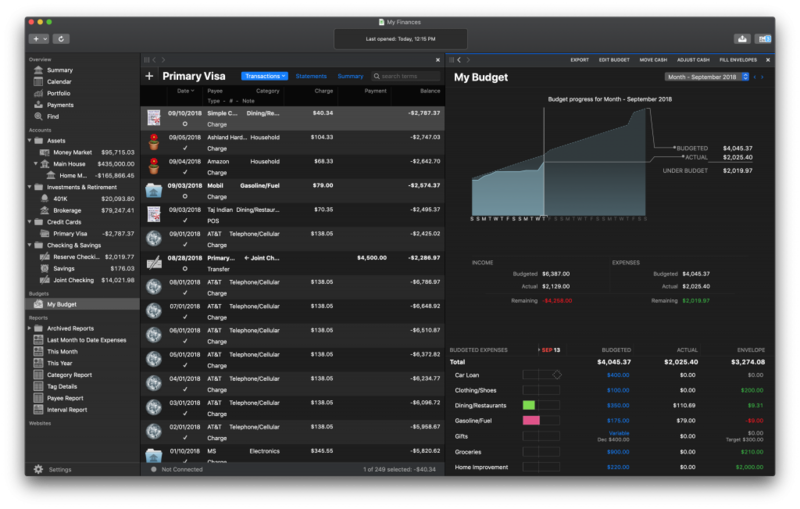 I hope those screenshots give a sense of how your finances will look in Dark Mode. 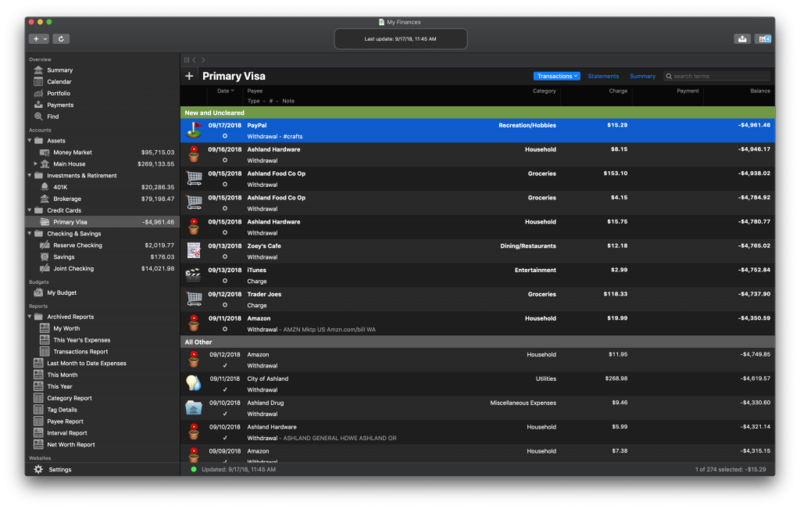 Although this is strictly a visual feature it shows our commitment to the macOS platform and overall user experience. One last thing to note: if Dark Mode isn’t your thing, don’t worry, the app still looks great in the Aqua user interface. It is true that you’ve always been able to track the value of your home or other real estate properties in Banktivity, but it has never been a great solution. In the past, you had to add an asset account and manually adjust the value of your home asset to what you think it might be. This approach has always left a lot to be desired. Wouldn’t it be nice to have the value of your home automatically calculated? And wouldn’t it be nice if you could easily see how much equity you have in your home after you factor in any mortgages or lines of credit? Well, now you can in Banktivity 7. For Banktivity 7 we’ve integrated Zillow’s estimating capabilities right into Banktivity. We’ve also designed an entirely new real estate view when you are looking at a home in Banktivity 7. Further, you can now link your real estate accounts with the loans associated with them and see a more complete picture of your properties all in one place. For the real estate view, there is no reconcile or search as they never really made sense for assets like a home. Instead, you get a simplified register view to show your “transactions.” On the right we show you the value of your home as recorded in Banktivity and the value of your home according to Zillow. You can click “Record It” to enter a transaction that will bring up the value of your home to match Zillow. Two things to note: 1) pulling of prices for Zillow is tied to your Direct Access subscription and 2) Zillow currently only supports homes in the United States. So if you aren’t a Direct Access subscriber and you have one or more properties in the United States, it might be time to reconsider! For many years our customers have been requesting a calendar view in Banktivity. They want a place to see their past and upcoming transactions as it relates to a calendar. 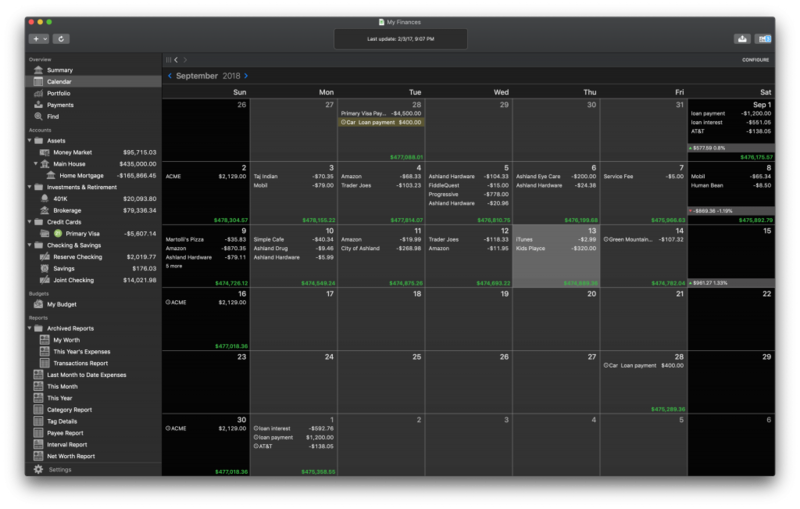 I’m happy to announce that Banktivity finally has a calendar view! Our new calendar view shows your posted transactions and upcoming scheduled transactions. It also calculates a running composite balance and a summary of how your investments have performed each week. The calendar is interactive too. You can click on transactions to see them in their account. For unposted scheduled transactions, you can click them and then take action on them by either posting them, skipping them, printing a check or paying online. You can also configure the calendar to only include the accounts you are interested in. Banktivity’s new calendar view lets you see past and upcoming transactions and important summary info. We’ve received a lot of great feature requests since the launch of Banktivity 6. We worked hard on implementing many of them, so much in fact, many deserve to be iterated here. Search Everywhere. Now you can search your payees, categories, accounts, securities and tags. Improved Reconciling. We made some great improvements to reconciling. You can choose to have Banktivity auto-reconcile all transactions, no transactions or just the cleared transactions. We also added search to the reconcile sheet and it remembers the last size you left it at. Last but not least, we made the button to create a statement more obvious! Customize the Summary View. You can now choose which accounts you want to be reflected in the summary view. You have options for the accounts used for your net worth, and for the income and spending calculations you can customize the accounts and categories. Create Reports Based on Reconciled Status. This is a small “nice touch” but for many people, it will be very welcome. In the past, there was no way to find all of your uncleared or unreconciled transactions across all of your accounts. Now you can make a transaction report that does just that. Faster Direct Access. Get your transactions into Banktivity faster. New Account Types. We’ve added a bunch more account types and you can even change account types after an account has been created, within reason. For example, you can’t change an investment account to a checking account, but you can change an investment account to a 401k. …and More. There are lots of other goodies throughout the app that I won’t go through here. I encourage you to try it out! 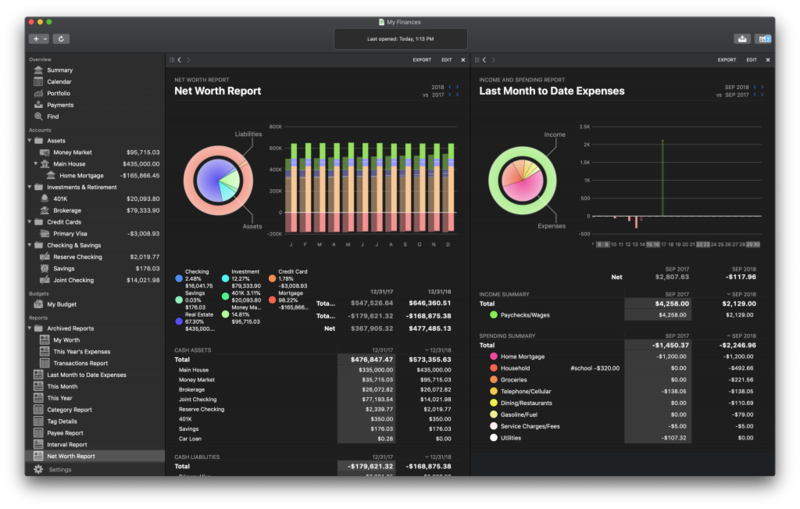 Banktivity 7 will only run on macOS High Sierra and macOS Mojave (at the time of writing macOS Mojave is the most up-to-date operating system). For the first time ever we are offering a free trial on the Mac App Store. The Mac App Store free trial is just like the one we offer from our website, it’s good for 30 days. If you have purchased Banktivity 5 or Banktivity 6 on the Mac App Store in the past you can now get upgrade pricing on the Mac App Store, yay! Regardless of whether you buy the app on directly from us or through the Mac App Store pricing is the same. Customers upgrading from Banktivity 5 or Banktivity 6 can get version 7 for $34.99 USD. If you are new to Banktivity, you can buy version 7 for $69.99 USD. Wait, I just bought Banktivity 6! If you bought Banktivity 6 directly from IGG Software on or after June 26, 2018 you can get Banktivity 7 for free. Just contact our support and ask for a new code and they will take care of you. Our 90-day money-back guarantee policy is only for our store on iggsoftware.com. When you buy Banktivity from another retailer like Amazon or the Mac App Store your purchase is governed by their refund policy. Launching a new version of a big powerful app like Banktivity is always a huge milestone to hit. (Really launching a new app, big or small, is a big milestone.) Our developers and QA have been hard at work on putting in new features, fixing bugs, all while keeping an eye at the future so we don’t accidentally box ourselves into some technological corner. If we didn’t put the feature you really wanted, I’m truly sorry. Deciding which features to implement is always a balancing between customers, technological requirements and outside forces (like Apple’s release cycle). This is truly the best version of Banktivity we’ve ever made. I’ve been using it for my personal finances for a while now and it’s a real joy. And of course, my finances have benefited from it as I’ve been strictly envelope budgeting for over a year now. So please, go out and download Banktivity 7 and let us know what you think! Couple of simple things I would like to add that need to be looked at. It seemed like it took forever for the Summary Page upcoming bills to match the scheduled transaction list in Banktivity 6, but it got fixed. Now with 7, back to the same thing. They don’t match. I have asked for a couple of years now to have the ability to put any characters into the check number field in transactions as only numbers are allowed. Please take a look at this. A lot of online transactions contain numbers, letters and special characters. Thank you for your hard work! Your products are truly amazing and I use them all everyday. I’m not sure if my previous question concerning budgets made it through so will try again. Asset transactions, which were not included in the budget in previous versions, now are. For example, I bought a camera in October, it shows up as an uncategorized expense in My Budget even though the Photography Equipment account I set up is an asset. Editing the budget to exclude the Photography Equipment account does not affect the budget report, although the note in the dialogue box for doing this says it should as long as it’s in the current month. I tried this out with other asset accounts and they also now show up in the budget report. I would prefer a setup where I can either control this, or have them excluded by default. Or, maybe I just haven’t been checking my budget as closely as I should’ve as I see now that the asset items have always been included (version 6 as well.) Having said that, setting the budget up so that they’re excluded still doesn’t seem to have an effect. I like the button to bring up scheduled transactions on the upper right. I like the Statement link in the registers (for those looking for the reconcile button, that’s it). I like that in reports you can drill down with out opening a new screen (other issues with this though). Constantly updating securities is totally annoying. I’m just glad I’m not on a limited data plan. That would be an absolute waste. Tax report still doesn’t cut it. You have a Tax Code field. Why is it so hard to create a report based on those? Need to have an option to sort on symbols in the portfolio. Again, why is it so hard to provide that? Reports in general seem a bit slow compared to Banktivity 5. I concur with your observation of Tax Codes not adding value to the tax reports, It seems they are there to provide a TurboTax export when in reality they could be useful in giving you a report or csv extract that can be handed to your CPA as is. As for Securities yes sorting could be useful but I think that page should be just a repository to enter and categorise; the Portfolio display should be providing security graphs , groupings etc. I was a B5 die hard but B6 shortcomings have been mostly addressed for me. in B7. Only B5 things I miss now is a statement summary for the reconciliation statement (ie ins/outs/end balance) and the quicklook plugin for attachments. Is there STILL no way to quick-enter categories without double clicking the transaction for a full edit??? Hi, you can enter edit mode by just hitting the Return key. You can also assign a category to any selection of transactions by control-clicking and picking a category from the contextual menu. I hope this helps! Hey…. that Control Click is a good alternative !! thanks…. I’d like to be able to quick-enter the Category without opening the full edit drop down. Just click on Category, enter Category, hit tab to move to the next transaction. I was able to do this in QuickBooks and it was much, much faster. Maybe a other way to see it ? Hopefully also coming soon is the ability to pinch and zoom via trackpad gestures. Or, a slider like MS office has at the bottom right of Excel spread sheets. Or, a +/- sign button which enlarges the viewing area. For transaction types for credit card accounts, why don’t you have “Charge” and “Return or Credit”? I think the ultimate enhancement would be user defined transaction types, I would create PAYPAL and APPLEPAY as types for example. User defined transaction types would be worth the upgrade alone. I’ve asked for it in the past… I’d want Direct Debit and Standing Order to start with. Is there a way to separate accounts by type in the sidebar? Banktivity 6 had them broken down by type and it seemed easier to see everything. You can control-click on accounts and put them into a group and organize them to your liking. I created a report to show all uncleared transactions in all accounts. This works fine for single transactions, but transfers do not appear. Customer Support indicated I must exclude one of the two accounts for an uncleared transfer to appear in the report, and I would have to create two reports—one for each account—to show transfers that are uncleared on both sides. This makes no sense; this is a bug. Why is it impossible to show *all* transactions that are *uncleared*? Why am I forced to Group New and Uncleared in every account, and manually click through every account every day to see what remains uncleared? The last version of iBank, using Smart Accounts, made this simple. Why does Banktivity make it so much more difficult? LOL… I am glad someone else has my work flow. I live by that report and yes I have had to create 3 Uncleared reports to be about 99.5% certain that I catch everything. This is consistent behaviour across the product BUT…. this does not make sense at the transaction level when you are trying to identify the Uncleared flag (ie it should not match transfers). I raised this as an issue and I agree it is not a good design when working on transactions, yes Smart Accounts made this simple and accurate. I hope this is reviewed and corrected. At least B7 has brought back the functionality and 99.5% is better than before. That may be a typo, but I believe the uncleared report absolutely SHOULD match transfers, twice in fact (one for each side). For example, I make a transfer from my checking account to my credit card. That is two uncleared transactions. I will clear the checking account transaction when and only when the debit hits my account. That does not mean the credit has yet appeared on my credit card. That is a separate transaction—and a separate cleared flag—that will get cleared only once the payment appears. Yes we are on the same page , Banktivity is taking a view that because nothing happens (ie in/out transfer) it matches and excludes them from the Uncleared report. The issue you highlighted is exactly real world situation, paying you credit card may be cleared in your check account immediately but will take several days to be posted and cleared by your CC provider. Hopefully this is resolved. I discovered a new twist on this issue. Per the previous workaround, I now have an uncleared transactions report for Checking and a second uncleared transactions report for all other accounts. Since all transfers go through my checking account, in theory these two reports should cover everything. However, for a transaction with splits for multiple transfers, only the first split transfer shows up on the uncleared transaction report. For example, I have a mortgage payment that comprises a transfer to the mortgage account and another transfer to the escrow account—only the mortgage (principle) transaction shows on the report. As another example, my paycheck transaction includes two transfers to my 401(k)—one for my employee contribution and another for the employer match—only the employee contribution appears on the report. The escrow and employer match transfers do not appear on any uncleared transaction report though they properly show in the registers for the respective accounts. Control-click the entry, a drop down menu will appear where you can enter/change the category as well as other things. Does this version have Touch Bar support for the MacBook Pro and in particular being able to login without a password and using Touch ID on the bar? The short answer to the Touch Bar support is NO but…. if you license Better Touch Tool you can customise your own Banktivity touch bar which I think is a better outcome because the Touch Bar will do what YOU want. BTT gives you a free trial period so you can play with it before you decide to license. The problem with BTT is that it can’t fill in a password if the file is so protected; if Banktivity supported the TouchBar natively then presumably it could. This would be a HUGE help to me! I am still looking for a good Cash Flow Statement in Reports. Why does my Banktivity 7 crash when I click on the calendar to manage/post scheduled transactions? I sent a request for help to support but have yet to receive a reply. Expenditure reports in Banktivity 6 showed the expenditure report analysed under each separate bank and credit card account making it difficult to see the expenditure in chronological order without looking through each bank or credit card account. This was a change from Banktivity 5 where the expenditure was just in chronological order. Before I decide whether to upgrade to Banktivity 7 do the expenditure reports once again allow full chronological order without the separate account headings? also, what is new in version 7.1? I agree! We need a manual! I have iBank 3 and want to upgrade to Banktivity 7. Is that possible? I plan to only use for account reconciliation, tax reports, budgets, but no connections to financial institutions. Where did the multiple line line graphs go in the cash flow projection report? Please tell me there is a way to find them. It is less useful to see all accounts rolled up (and we already have that in calendar anyway now). It is more useful for planning to be sure cash flow accounts like checking do not go below zero as we plan expenses and debt pay off. I used to love watching my debt accounts go up to zero, but yet monitor that my checking doesn’t fall below. If this is truly gone, I will likely be sticking with V5. FWIW, I’m also not a fan of the way the register looks and how when you go to click it to make a change, the fields move to other places. I do like the calendar. 1. The ability to click & drag an entry from an account register onto another account on the account list on the left-hand side column. Sometimes one enters a transaction in the wrong register and then has to delete and enter in another register. 2. More category icons!!!!!!!!!!!! I’m tired of seeing my personal expenses represented by a potted flower, my older son’s by a graduation cap, my younger son’s by a pacifier (he’s 15), and my husband’s by a coffee cup. LOL. 1. One is an interesting enhancement, I like the idea. Mind you, you can CUT and PASTE transactions between accounts to correct posting errors. 2. you can easily add png’s to categories, you are not limited to the ones on the base product. i would like to use this more but it is currently of limited use because of debit card balances that i pay monthly. if i include the cards balance is way too low until date when i pay the balance. if i don’t include them it doesn’t allow me to forecast the payment. How about a brief manual on the new features to Banktivity 7? How about providing a way of Squeezing the Categories by their level, as could be done in iBank 5? I haven’t upgraded to 7 yet. Since we’ve started a new year, I’m wondering if there’s a simple way yet to duplicate last year’s budget and then modify it for the current year. Or do I have to reenter the whole thing from scratch (which isn’t so fun since I use variable-month budgeting for most of the categories). I have this question too. I have been a loyal Banktivity customer since version 3. This is the feature I have wanted most. Is there a way to duplicate a budget so I can just make a tweak to it? Is a feature like that in the works? Coming one day soon? I hope. Would love to see a response to this. Does version 7 have the ability to change a transaction’s account easily without having to completely redo it in thr correct account? If I accidentally add a cash purchase when I meant to put it as a debit card purchase, there isn’t an easy way to do that which is very, very annoying. Why can’t the account be changed or at least allow us to drag and drop transactions onto the correct account. Best option is to cut and paste the transaction. On entering securities transactions there is a commission field for brokerage fees. My question is how do you get a report on how much commission had been paid over a period of time. Some good new features in 7, especially since the fix for properly updating securities prices on Mondays (which never seemed to work before), BUT…….something I never had any problems with in version 6: lots and lots and lots of delays/spinning beach balls when clicking around the program, such as dragging files to the attachment box, closing the program, and other operations. It’s certain no fun trying to navigate through these. I am using the latest system software with lots of memory, so I don’t understand why this is happening. I had no idea there is a version 7, and I hope the dark mode isn’t the only option. But right now I’m feeling pretty desperate about version 6. It suddenly expanded to fill the screen and the green dot in the upper left (to modify the screen size) doesn’t bring it back to normal size. Is version 6 now defunct? If I buy version 7 will that solve the problem? I’m getting nervous about this because it would be a disaster if I lost the use of this app, and I am unable to use it now because I can’t shrink it to a usable size. Putting the cursor in the lower right side – the way the adjust the screen size – doesn’t move anything.